Amatrol’s Portable PLC Troubleshooting Learning System — Siemens S71200 (990-PS712F) teaches programmable logic controller (PLC) programming, operation, and applications used throughout industry. The system also utilizes FaultPro, the industry’s premier computer-based fault insertion system. FaultPro enables learners to develop key PLC troubleshooting skills, such as PLC input and output testing, software testing, and application troubleshooting. The portable Siemens PLC troubleshooting training system features real-world components, such as the powerful Siemens S7-1200 PLC and a Siemens Human Machine Interface (HMI) panel. Combined with Amatrol’s in-depth curriculum, learners will gain both theoretical and hands-on knowledge by studying industry-relevant applications and troubleshooting skills that will build a strong foundation for a rewarding career in a variety of industries. Amatrol’s portable Siemens PLC troubleshooting training system features multiple real-world applications that enhance learning by allowing students to see their programs control real systems. In addition to a discrete I/O simulator with discrete switches and indicators, the system includes application circuits and components for thermostatic temperature control, analog temperature control, reversing constant-speed motor control, variable speed motor control with feedback, and stepper motor control. These circuits include basic and advanced applications starting with discrete I/O projects and extending to projects involving motion control and analog I/O. 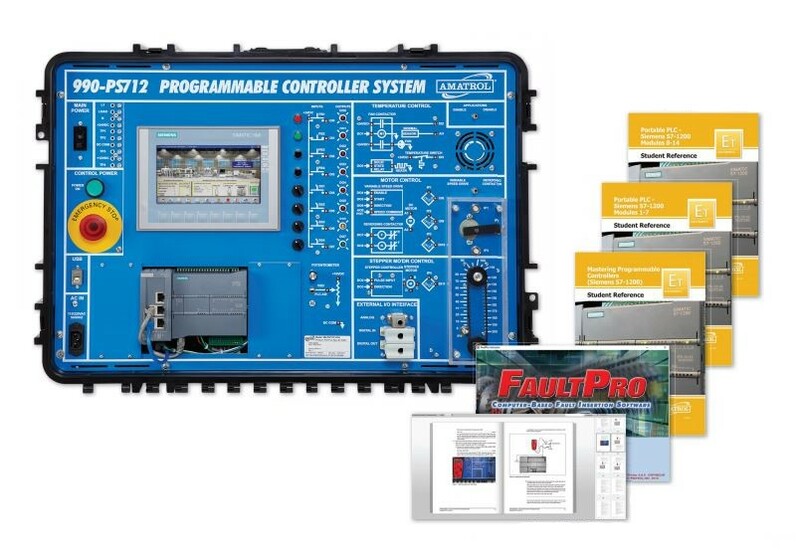 The portable Siemens PLC troubleshooting training system with FaultPro includes a variety of electronic faults that present realistic situations that technicians encounter on the job. This allows learners to develop important PLC troubleshooting skills, like PLC input and output testing, software testing, and application troubleshooting. Learners will practice skills, such as using a six-step sequence to troubleshoot a PLC system, troubleshooting a PLC routine that performs on/off control using an analog input, and testing a PLC-controlled PWM output device. FaultPro’s computer-based faults automatically track progress, enabling learners to gain troubleshooting skills in a self-paced environment that ensures that faults are inserted safely, protecting both learners and equipment. The portable Siemens PLC troubleshooting training system features in-depth curriculum that teaches a wide variety of PLC topics, from basic operation and programming to troubleshooting. Learners will apply theoretical knowledge to hands-on skills that build real-world experience. For example, learners will practice hands-on skills, such as: configuring the IP address of an S7-1200 PLC; downloading and running a PLC project that performs logic operations; entering and operating a PLC project that uses seal-in logic to control a motor; troubleshooting a PLC-controlled variable speed drive; and troubleshooting a PLC-controlled PWM temperature control application. The curriculum is also available in a convenient eBook format with enhanced features like keyword searches and zoom controls that enable users to quickly locate and view information. Sample copies of the Portable PLC — Siemens S7-1200 and Mastering Programmable Controllers (Siemens S7-1200) Student Reference Guides are also included with the system for your evaluation. Sourced from the system’s curriculum, the Student Reference Guides take the entire series’ technical content contained in the learning objectives and combine them into perfectly-bound books. Student Reference Guides supplement this course by providing condensed, inexpensive reference tools that learners will find invaluable once they finish their training, making them the perfect course takeaways.